You know I am a sucker for easy recipes. They are essential to any busy mom’s life. A few of my friends have shared their favorite easy to prepare recipes with you guys. Each of these are also easy on your pocketbook, which is a win-win! Tortilla Pie– this looks yummy and easy. Packed with protein filled beans and cheese. Yum! Peanut Butter Pie– this recipe has a short ingredient list and is a great crowd pleaser! And it is very budget friendly, too! Yummiest Chicken Wings– these sound like the perfect football game day dinner. The rosemary and mustard combination has my mouth watering. Super simple. Harvest Cinnamon Zucchini Bread– this must be what fall tastes like. I just might make this for Thanksgiving! And, this is a great way to get your kiddos to eat veggies while they think they are eating dessert. Sneaky much? Girl Scout Stew– five ingredients and you can eat this for days. It has been getting down in the 30’s at night here in Texas. Need I say more? Potato Corn Chowder– this costs less than $10 to make and is perfect for a cold night. Which meal will you add to your menu? 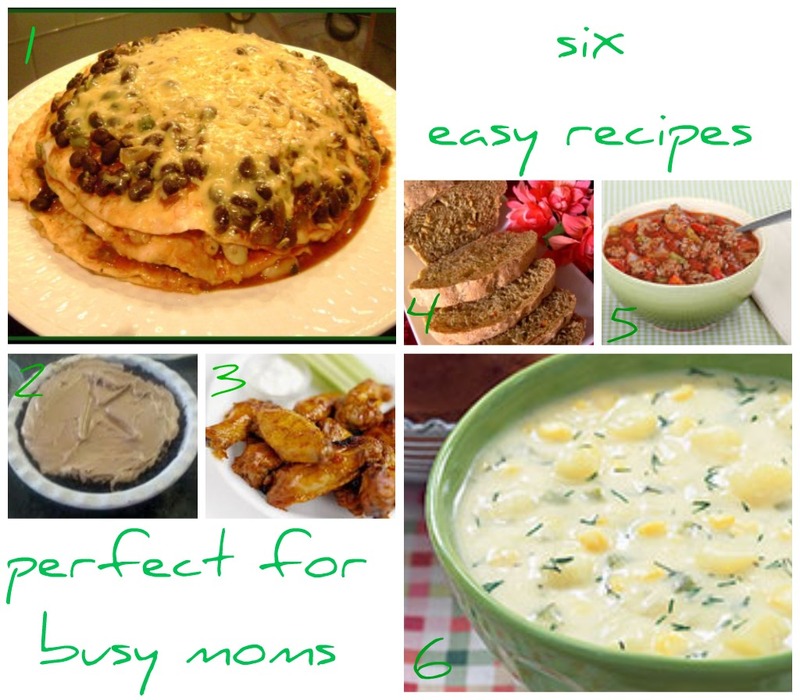 Need more easy recipes? I have a long list of them here at Crystal & Co.! I am sharing this recipe list on these delicious sites: i heart naptime, the girl creative, C.R.A.F.T. craftomatic, crafts keep me sane, skip to my lou, making the world cuter, a southern fairytale, sumos sweet stuff, mad in crafts, tip junkie, tasty tuesday, tempt my tummy tuesday, craft edition, hope studios, todays creative blog, sew much ado, someday crafts, we are that family, blue cricket designs, somewhat simple, paisley passions, house of hepworths, fun to craft, fingerprints on the fridge, tidy mom, a few of my favorite things and it’s a hodge podge life. Looking for a more copious list? Here are over 50 sites to search for and share projects and tutorials. Considering making this in my crock pot today. Mmm, I’m eyeing that zucchini bread! This is my favorite easy, thrifty, healthy main dish recipe! It takes an hour to bake, but you can be doing something else during that time, and getting it ready to go into the oven takes 10 minutes or less. It’s all shelf-stable ingredients, perfect for times when you planned to go to the store but couldn’t.